Marion County Courts begin E-Filing... but not the Township Courts. Marion County Circuit and Superior courts began e-filing on all cases except juvenile last Friday (10/28.) A couple of users have inquired about whether the Marion County Township Courts are included. They are not. In addition, we have learned that Marion is one of the counties where payments to the Sheriff for civil process (service) must be made directly to the Sheriff when the document is delivered rather than paid via the e-filing system. This has been noted on our list of counties and how they handle sheriff's civil process payments. In order to respond to a request from some of our newer users, we've broken out documents that are or relate directly to Easements into their own document type. These documents were generally located under Miscellaneous in the past, and this change should make them easier to locate. 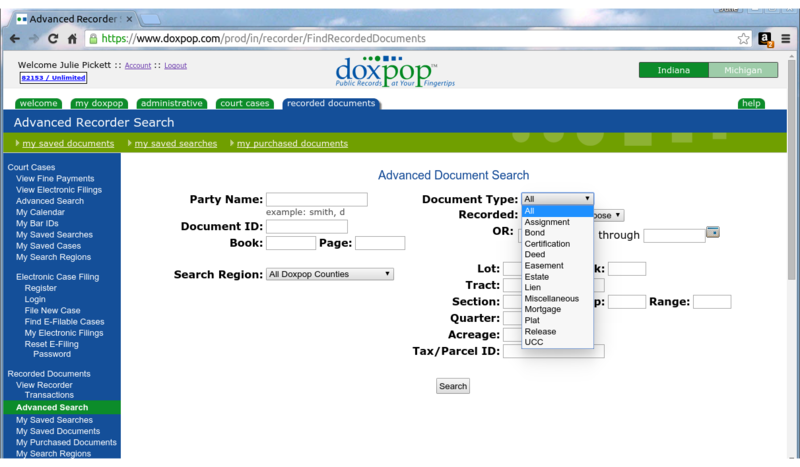 To see all of the document type options, visit our Advanced Search in the "recorded documents" or "register of deeds" tab and select the drop-down menu for Document Type. This will display all of our searchable document types. For more help with Advanced Search, visit our help section or contact us. Validation date added to Recorder (IN) and Register of Deeds (MI) records. The validation time for each county office is the recording time of the most recent document that has been verified. This means all documents recorded at the same office before that time have been completely indexed and verified. This works because the indexing system used by all Recorders and Registers that send their information to Doxpop is designed to ensure that documents are indexed and verified in the order they are received. 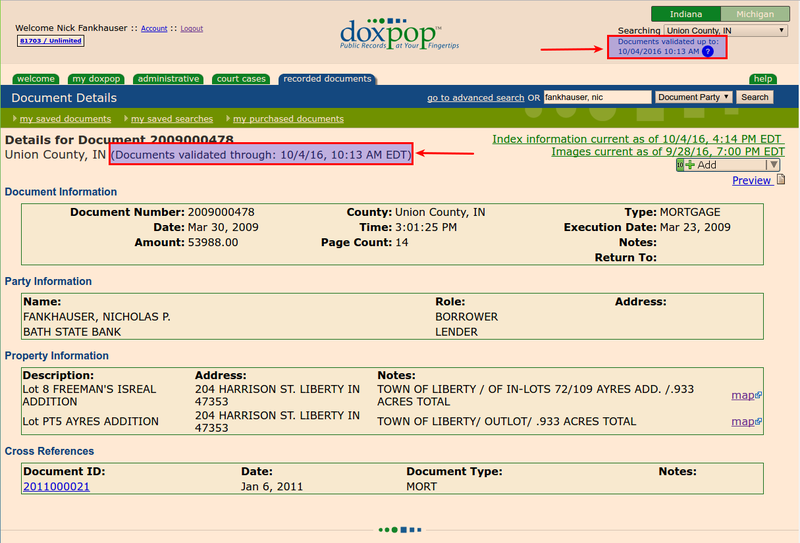 The validation time allows researchers put the appropriate effective date on research they do through Doxpop. When selecting a single-county region for any document search, you will find the validation time for the county displayed under the region box. When viewing the index details for any document, you will find the validation time for the source county of that document in the top left corner, next to the county name. If you have any questions about validation times, please feel free to give us a call or email.